14,870 others viewed this post. I finally got a clear night to make a photo! When I say “clear” I mean, I setup in the rain with the cloud radars promise of an hours band of relatively clear sky before the moon came up. 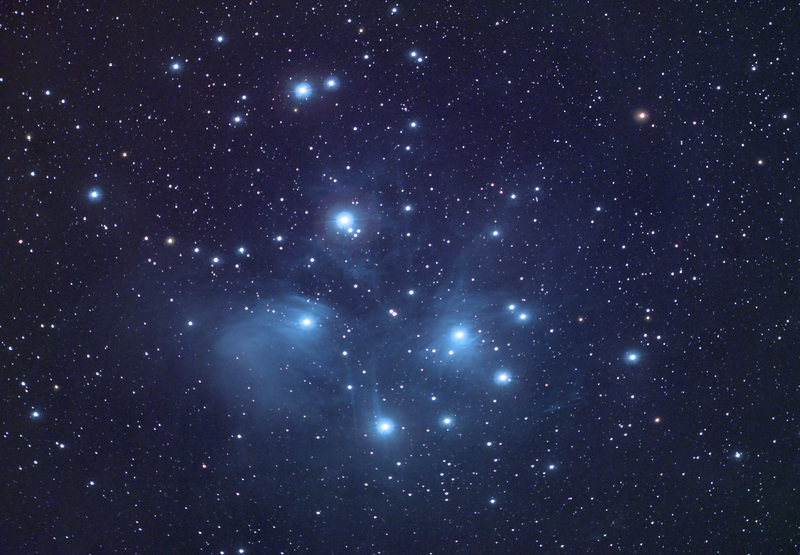 I could tell you a story about the “seven sisters” or that you already know this cluster of stars from the Subaru logo, but I think it’s beautifully captivating as it is – a powerfully large and wispy reflection nebula within an open cluster of middle aged bright blue-white hot stars. Easily seen with the naked eye in the early summer evening sky (winter for you Americans! ), it’s a favourite target for serious astronomers and casual star gazers alike. For the nerds, I polar aligned tonight using Astrotortilla plate solving instead of PHD and it was spot on! Great method, I highly recommend. 19 x 180s : total 57 minutes exposure. Celestron 9.25″ Edge HD SCT, Hyperstar, UHC filter, QHY12 CCD.